Egg Farmers of Alberta and the province’s more than 170 egg farming families enjoy talking to Albertans about eggs and egg farming, which is why EFA founded an Egg Ambassador program several years ago. This eagerness to share their story about how fresh, locally produced eggs get from their farms to your breakfast tables, is something all Egg Ambassadors across the province are passionate about! This is why local egg farmers have been bringing a live layer hen display to major agricultural events all over Alberta for the past three years, at events such as the Calgary Stampede, Aggie Days Calgary, Aggie Days Lethbridge, Amazing Agriculture in Edmonton, and the Medicine Hat Stampede. What Alberta egg farmers would really like to do is open their barn doors and invite everyone out to their farms, to see for themselves what it takes to raise and care for layer hens, and produce high-quality, nutritious local food. 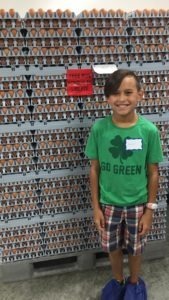 This summer, EFA ran a contest on social media, with the prize being a tour of a local egg farm for two lucky families! 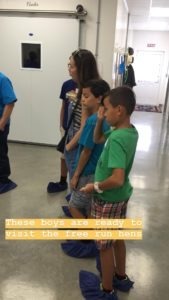 On August 23, the Tabelon family – mother Rochelle, and her three sons Nole, Emerson and Nixon – joined EFA staff for a tour of the egg barn at Brant Colony. 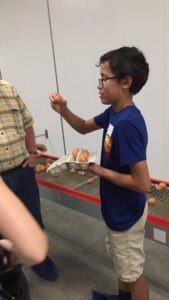 Our gracious hosts, lead by egg manager Darrel Mandel, took the family on a tour of the barn, which included spending time walking with the laying hens and helping to collect eggs laid that morning. EFA staff is fortunate to have many opportunities to visit egg farms and engage with the farmers we represent. 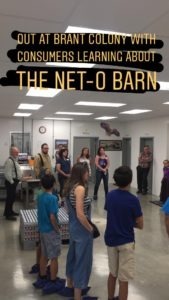 This consumer tour was a unique opportunity to see the layer barn through the eyes of consumers, including several children, who were interested and intrigued to learn more about where their food comes from. 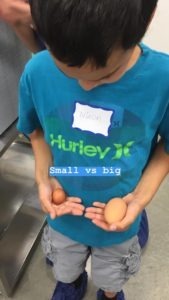 We look forward to more opportunities to work with our Egg Ambassadors to find unique and engaging ways to share the story of local egg farming, and the fresh, nutritious eggs provided by more than 170 egg farming families from right here in Alberta!